Before his high-profile gigs with David Lee Roth and Whitesnake, Steve Vai served time as Frank Zappa's guitarist in the early '80s. And judging by Vai's first two solo albums released around this time, 1984's Flex-Able and Flex-Able Leftovers, he was heavily influenced by Zappa's songwriting and compositional skills. Although there is definitely a noticeable Zappa stamp on the tunes, Vai's own personality and awe-inspiring guitar chops are what really make these two solo albums so impressive. Also, Vai was one of the few guitar heroes of the '80s to stress the importance of songwriting over mindless soloing. While Flex-Able was a full album, Flex-Able Leftovers was originally just an EP of material that didn't make it onto the debut. When Flex-Able was released on CD in 1988, a few tracks from Leftovers were included as a bonus, yet fans have wondered all along if the full EP would ever be released on CD. Ten years later, their wish came true. Not only has the EP been re-released, but unreleased tracks from that era are included, making up a full-length album. Vai's over-the-top humor can be sampled on the profanity-fest "#?@! Yourself" and the goofy "So Happy," while "Massacre" and "Natural Born Boy" feature his immense guitar skill. And Vai's unique songwriting talent is evident on such tracks as "Burnin' Down the Mountain," "The Beast of Love," and "Bledsoe Blvd." 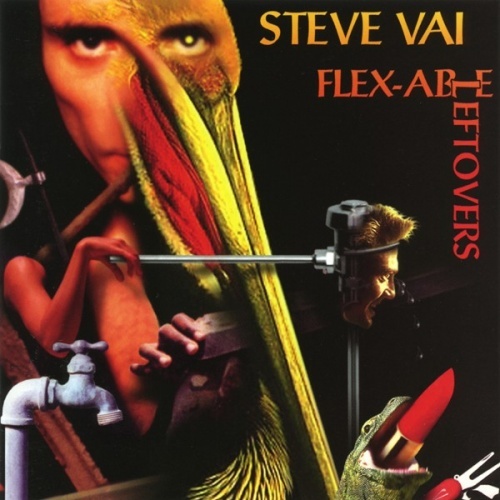 The 1998 version of Flex-Able Leftovers is highly recommended to guitar freaks everywhere, as well as lovers of completely original and cutting-edge rock music.